We still don't know much about the mysterious Nintendo NX console, but that's not stopping Ubisoft's CEO Yves Guillemot from already heaping on praise. "I believe Nintendo will be back in the race with the NX," said Guillemot during a meeting with Ubisoft investors, according to French journalist Chloé Woitier. 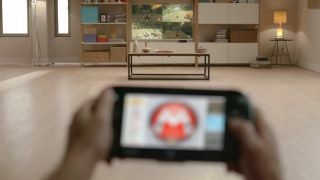 "The new Nintendo [console] is a fantastic machine," Guillemot added during a separate Ubisoft presentation, according to GameSpot. "It's really a new approach, it's really Nintendo, [which is] coming with something new again. We love it." This is a stark contrast to the strained relationship between Nintendo and Ubisoft during the days of the Wii U. Back in 2014, both Activision and Ubisoft backed away from Wii U development, instead concentrating on the Xbox One and PS4. Of course, it's in Ubisoft's best interest to hype up the Nintendo NX. The publisher will likely release a ton of games for the new platform when it launches, giving it another platform to sell its games. It was Nintendo that helped popularize Ubisoft's Just Dance franchise in the early years of the Wii. Just Dance 2017 is confirmed for the Nintendo NX, and Ubisoft says it's working on "other projects" for NX, according to another GameSpot report. Although Ubisoft may be building up the Nintendo NX, we actually don't know very much about it. There are rumors the NX is a console-handheld hybrid, revisiting the Wii U's controller concept. You'll allegedly be able to take it on the go and dock it when you're at home to be able to use it like a traditional console. Nintendo unofficially revealed the release date of the NX console for March 2017, which means the company will miss the critical 2016 holiday season. Unfortunately for Nintendo, competing consoles from Microsoft and Sony will beat the NX to market. The Xbox One S, which offers 4K movie watching and a slight performance bump, is already available starting at $299 (£249/AU$399). The PS4 Pro, which supports 4K gaming, is available on November 10 for $399 (£349/AU pricing TBA).